Gives a history of the Congo, discussing the days of its European occupation, the culture of its people, and its current status as the Democratic Republic of the Congo. Examines the history of East-Central Africa from 1880 to the early years of the twenty-first century, discussing the natural beauty of the region, and tracing the origins of the civil wars that have erupted since the end of European colonial rule. Examines the past, development, inhabitants, and many cultural aspects of South Africa. Explores events in the history of West Africa since 1880, focusing on the country's struggles to compete in the modern world as an independent nation following a century of foreign dominion. Traces the history of five modern African nations, Malawi, Mozambique, Zambia, Zimbabwe, and the island of Madagascar, from 1880 to the present, describing the different paths each nation took to freedom during the early and mid-twentieth century. Photographs and text look at the past, development, and present culture of Nigeria and its inhabitants. Examines the history of Sudan, discussing the importance of the Nile to the African nation, looking at the lives of its people, and considering the challenges the country faces in the future. Provides information about the history, geography and natural resources, government, economy, people, culture, and cities of Sudan and South Sudan, and includes a calendar of festivals, recipes, and other reference materials. Discusses the time period from 1783-1914, covering various empires, religions, cultural movements, developments, political alliances, and civilizations around the world, with detailed maps depicting expansion, migration, populations, and more. Examines the impact the British empire had on world government, economy, and culture from the seventeenth century to the mid-twentieth century, and explains why the empire's dominance subsided in the last half of the twentieth century. 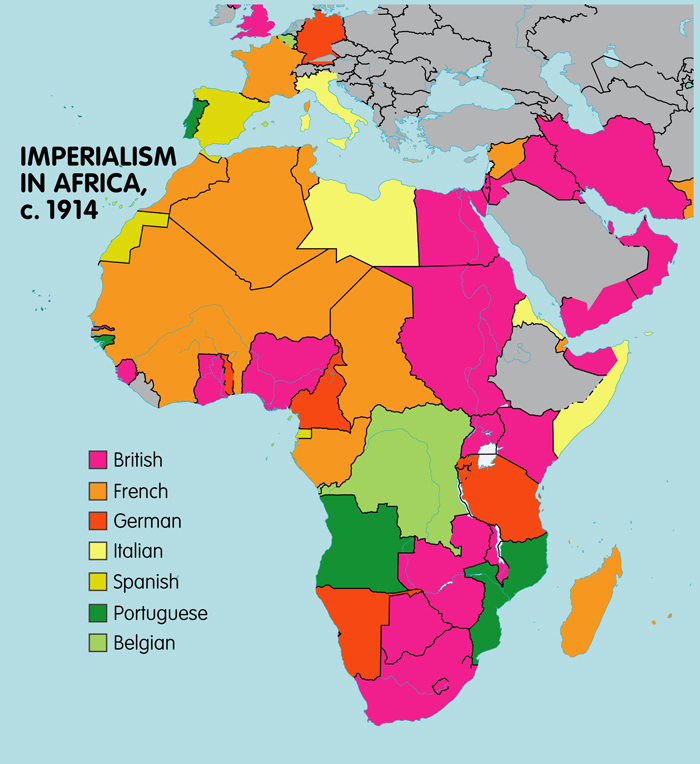 From the 18th century on, expanding European imperialism across the globe began to pose acute challenges to states and societies throughout Asia and Africa. The colonisation of Africa was part of a global European process reaching all the continents of the world. European explorers and missionaries began mapping the interior of Africa in the nineteenth-century. he 'Scramble for Africa' – the artificial drawing of African political boundaries among European powers in the end of the 19th century – led to the partitioning of several ethnicities across newly created African states. .... coincided with the imperialist war efforts against the governments of Col.